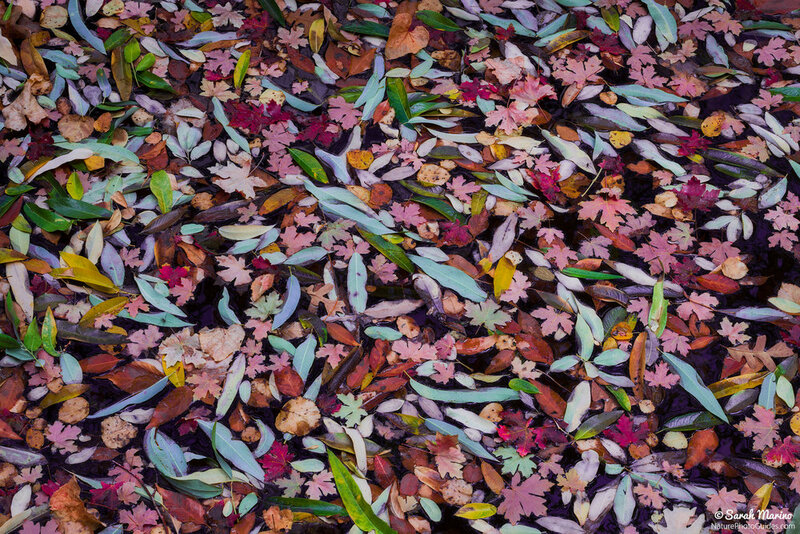 A pond filled with colorful leaves, found somewhere in North America. Leave No Trace, a national outdoor stewardship organization that is best known for its 7 Principles, recently released new guidance related to sharing location information about natural and wild places on social media (you can see the full post here). Encourage and inspire good stewardship practices when sharing photographs on social media. In a discussion about this topic on Facebook, our photography colleague Phill Monson made another important point. With the number of people visiting wild places, Leave No Trace is more of a place to start. In addition, Phill is advocating the framework of "Leave it better than you found it." Since the photography community has played a major role in increasing visitation and bringing along the associated impact on special places, I agree with Phill that we as individual photographers have a responsibility to play a more proactive role rather than the more neutral (but still incredibly important) role suggested by the Leave No Trace principles. I have experienced a lot of sadness and guilt over my own decision to share sensitive location information in the past. I was completely naïve about how people would use the information I was sharing and that decision possibly led to some special places being damaged by photographers whose top concern was getting the shot. As the co-author of two location guides, I am still trying to figure all this out for myself but am overall happy to see Leave No Trace advocating these positions since the impact of sharing location information is obvious to anyone who has seen some places before social media and after social media. If you have thoughts on this topic, I would be interested in hearing them… For example, does this kind of guidance from a major stewardship organization change your thinking about sharing location information with your photographs? White Sands National Monument. Footprints will remain in these areas of hardened sand (so I didn't walk on them), but will disappear from the dunes themselves during the next wind storm. I came to photography well after I started hiking and backpacking. Thus, my early sources of information about wild places all prominently featured advice about outdoor ethics, especially practices like Leave No Trace. If you are not familiar, the basic idea behind Leave No Trace is that travelers in the backcountry should strive to leave no evidence of their visit, minimize their impact, and if possible, improve the condition of the places they visit (leaving a campsite in better condition than you found it, for example). With many wild places experiencing increased visitation, human impacts can cause significant damage if visitors do not show this kind of respect and care during their visits. Increasingly, it seems like some landscape photographers do not view these principles for outdoor ethics as applicable to our kind of outdoor pursuit and the damage left behind is becoming obvious in an increasing number of spots. I have recently engaged in a few online discussions on this topic and have found some of the responses disheartening, with some portraying the attitude that they are entitled to a photograph regardless of their impact. Other arguments favor a dismissive tone, downplaying any specific example as an exaggeration for nothing more than making a point or so minor that it doesn't matter (trampling some plants is no big deal). All this seems to be a sign of the times, with daily stories about how the forces of willful disregard, ignorance, entitlement, and narcissism combine to do a lot of damage to special places (click on the links for a sampling: national parks in general, the Appalachian Trail, Sedona, Death Valley, and Joshua Tree).